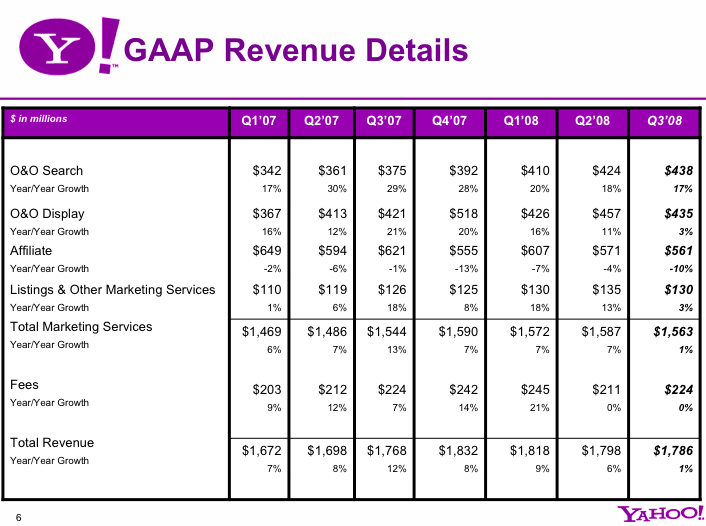 Yahoo just announced third quarter earnings. Revenues were flat, up one percent to $1.79 billion. The company met consensus earnings estimates of $0.09 a share. CEO Jerry Yang on the conference call says that yahoo will lay off “at least 10 percent by year end.” That’s 1,500 people, as expected. (Yahoo ended the quarter with 15,200 employees). And that might not be all. He calls he headcount reduction a “first step” and that “additional structural changes” may be taken in 2009 and beyond. On the Google search deal, he says “We are continuing to work with the DOJ.” So no progress there.